Tajudeen Oyewole a.k.a. 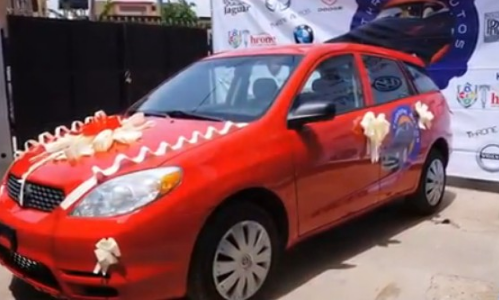 Abija, a veteran actor of the Yoruba movies genre, was presented with a car by a car shipping company in Lagos. 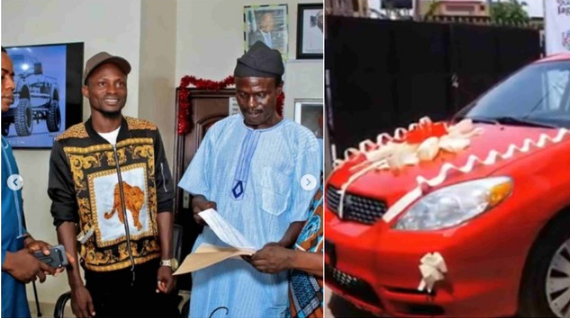 The actor who could not hide his joy was seen full of smiles as he was handed over a brand new Toyota Matrix to celebrate his great achievement. Present at the car presentation ceremony was Mr Latin and other actors. Abija, who is one of the pioneers of indigenous Yoruba movies, was recently in the news over his poor state of living. Actor Jigan had solicited for help for the veteran actor whom he believed was one of the people that paved the way for the current crops of successful actors in the Industry.